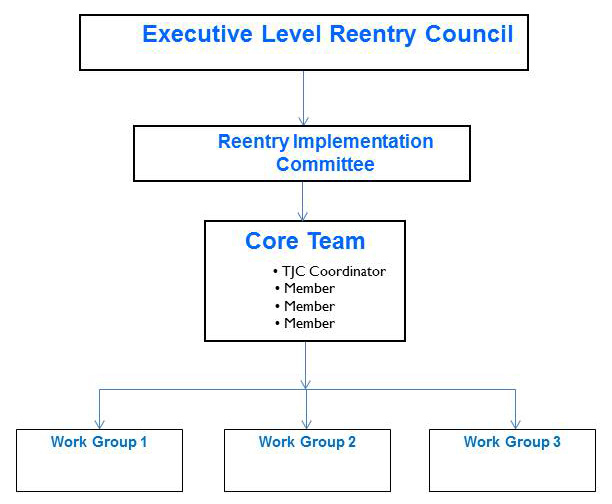 In many jurisdictions, the executive-level reentry council is initially charged with developing the organizational structure of the reentry implementation committee. This council should be composed of high-level individuals such as sheriffs, county commissioners, city council members, jail administrators, judges, and officers of the court. They provide the jail-to-community reentry effort with broad strategic guidance, give it legitimacy in the jurisdiction through their support, and hold it accountable for meeting its goals and objectives. Many jurisdictions already have an executive-level reentry or criminal justice coordinating council or some other established body that can serve in this function. Adding the TJC Initiative, however, to the agenda is key. Championing the initiative in the community. Serving as a vehicle for community-wide communication. Selecting members of the council's committees and subcommittees. Holding the initiative accountable for meeting performance measures. Setting policy for the TJC initiative. The reentry implementation committee is a central team of individuals who oversee the detail-oriented work of devising and implementing the jurisdiction's TJC strategy. The implementation committee needs to have an active and committed membership to carry out its work. Knowledge and ability to make a time commitment may be more important than formal position in selecting committee members. In some jurisdictions, members of the executive council will meet to recommend implementation committee membership. Some of the members may come from the reentry council (although they may be too busy to make the necessary commitment), whereas others will be from the greater stakeholder community. In other jurisdictions, the implementation committee is convened prior to the executive-level reentry council. Communicating regularly with the executive-level reentry council to keep them fully informed on the progress of the TJC initiative. Providing recommendations to the executive-level reentry council on important decisions in the design and implementation of the initiative. Developing goals, outcomes, and measures for the TJC initiative. Convening and overseeing work groups to address specific implementation issues. Identifying what entity or person will complete these tasks. Providing for clear date of review for each of these to monitor the progress of the group. Task 2: Collaboration Structure and Joint Ownership of the TJC Implementation Roadmap to see a to-do list of the tasks and subtasks needed to create and implement a collaborative structure. Consider inviting the jail's TJC reentry coordinator (e.g. point person), mental health providers, defense attorneys, community shelter staff, educators, community corrections officers, housing authority staff, the district attorney's office, victim's advocates, health care providers, employment specialists, people from the faith community, and other social service providers to serve on the reentry implementation committee. An effective core team is an integral part in the success of implementing TJC in your community. Unlike, the executive-level reentry council and the larger reentry implementation committee, the core team is the key mechanism for sharing day-to-day leadership of the TJC effort. This small group of people work closely with the designated TJC coordinator who is championing the TJC model in your community to monitor progress, identify priority tasks, and carry them out. Core teams create multiple keepers of the “big picture” regarding the TJC strategy and increase the ability of sites to make progress in multiple areas simultaneously. The most effective core teams include people from different agencies, representing both criminal justice and community spheres, who contribute varied perspectives and knowledge bases to TJC implementation planning. A responsibility of the reentry implementation committee is to convene and oversee work groups tasked on specific implementation issues. Volunteers for these working groups can come from the reentry implementation committee membership or from key players outside the committee who have the skill set, subject expertise, and the interest in completing these tasks. For example, a community provider with expertise in correctional programming may be involved in a curriculum development subcommittee but may not be on the reentry implementation committee. Work groups will complete concrete, discrete tasks delegated to them by the reentry implementation committee. The committee should give them clear, written directives with defined end products; the committee should bring its results to the executive-level reentry council for review and approval. Experience from the TJC Phase 1 learning sites informs us that working groups are most efficient when they are assigned a specific purpose, accomplish their assignment, and then disband with the understanding that the group can be renewed whenever appropriate. Each working group automatically expires after 12 months, unless the reentry implementation committee determines the group should continue. Click here to see the responsibilities, list of members, and invitees of The Howard County, Maryland, TJC Organizational Structure. The success of the reentry implementation committee will depend more on what responsibilities participating agencies accept rather than what they are obligated to contribute. Nevertheless, though normally not legally binding, formalizing the process by drafting a memorandum of understanding (MOU) expresses a long-term commitment to the process and adds a sense of credibility and professionalism to the reentry collaboration. Facilitates communication by defining a process for regular meetings, phone contact, or data exchange. Protects both parties against differing interpretations of expectations by either party by spelling out details of the relationship. Enhances the status of the case management agency in the community through formalized relationships with established or influential agencies. Reduces friction over turf issues by specifying responsibilities. Transfers authority to perform a mandated function from one agency to another or from one level of government to another. Creates a clear and formalized agreement to move forward and partner together. Specifies services for a provider agency to provide to clients. Specifies the type of clients appropriate for the case management agency and how referrals should be made. Cuts through red tape by defining new or altered procedures for clients. In many small jurisdictions, resources are limited and populations are often too small to warrant funding or attention for programming and other transition efforts. To enhance their ability to perform justice system functions effectively, many local governments enter into formal agreements to pool their resources and populations. Such intergovernmental collaboration demonstrates information-sharing commitment and the potential to sustain TJC efforts. Jails, governmental agencies, and community-based organizations may need to develop formal linkages with each other outside of the reentry implementation committees' MOU. Linkages would include agency-to-agency formal agreements with probation and public health departments, community health centers, community mental health centers, drug treatment programs, STD counseling and test sites, tuberculosis clinics, Medicaid offices, HIV infection services, one-stop workforce centers, housing providers, and service providers presently working with those transitioning from jail to the community. Referring inmates to community providers. Informing providers about the release of relevant individuals. For example, those with a history of homelessness and mental illness. Sharing release plans with providers. Developing systems for sharing the information, such as electronic databases or regular meetings among providers. Crayton, Anna, Liz Ressler, Debbie Mukamal, Jesse Jannetta and Kevin Warwick. Partnering with Jails to Improve Reentry: A Guidebook for Community-Based Organizations, Urban Institute. Cushman, Robert. C. 2002. Guidelines for Developing a Criminal Justice Coordinating Committee. 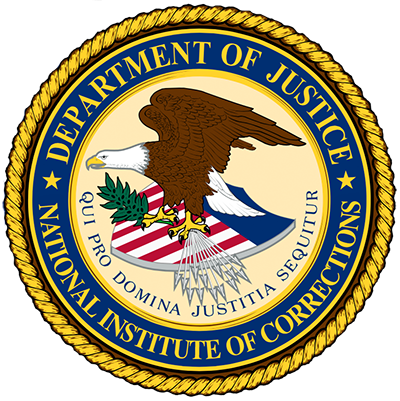 The National Institute of Corrections. Davidson County, TN. Faith-based jail to the community work group statement of purpose with measurable short and long term goals. San Diego, CA. San Diego Reentry Roundtable Overview. Howard County, MD. TJC Organizational Structure. Douglas County, KS, Sheriff’s Office Reentry Programs highlights reentry-related programs at the jail, acknowledges staff from the jail and community by name for their work, etc. Denver, CO. Initial organizational chart, and working group outcomes explaining early TJC initiative structure and responsibilities (Large jail example). Kent County, MI. Initial organizational chart explaining early TJC Initiative Structure (Medium/large jail example). La Crosse County, WI. Initial organizational chart and mission explaining early TJC Initiative structure (Medium/large jail example). San Diego, CA. San Diego County TJC Initiative Structure. (Large jail example). Johnson, Mary, and Linda Sterthous. 1982. A Guide to Memorandum of Understanding [MOU] Negotiation and Development. This is a great guide for a complete understanding of how to develop an MOU. The authors provide model MOUs that are easily adaptable when developing interagency agreements for a returning population. Davidson, County, TN. Memorandum of Understanding between Sheriff's Office and TJC partner agencies (Davidson County, TN). New York City Department of Health and Mental Hygiene Memorandum of Agreement example is a template to use between agencies. Note the paragraph on page 2 of the NYC MOU dissolving both parties of liability. A similar provision in your MOU could make the agencies you approach more comfortable signing such an agreement. Orange County, CA. Memorandum of Understanding between Sheriff's Department Inmate Reentry Unit and TJC partner agencies (Orange County, CA). Snohomish County, WA. Department of Corrections’ Collaborative Agreement with the County’s Human Services Department and the Washington State Department of Corrections. Sullivan County, NH. Department of Corrections’ Memorandum of Understanding. Denver, CO. Partnership agreement with vision/ mission. Informal agreements have been shown not to work. They help build cohesive teams. They spell out details of the relationship. 2. MOUs add credibility and professionalism to the reentry committee's collaboration. Now that you have completed this section, you understand the process to formalize a collaborative structure through a pyramid-style structure composed of an executive-level reentry council, reentry implementation committee, and work groups. You also recognize that defining clear roles and responsibilities, as well as having memoranda of understanding between your facility and agencies, can be useful in clarifying and professionalizing agency roles.